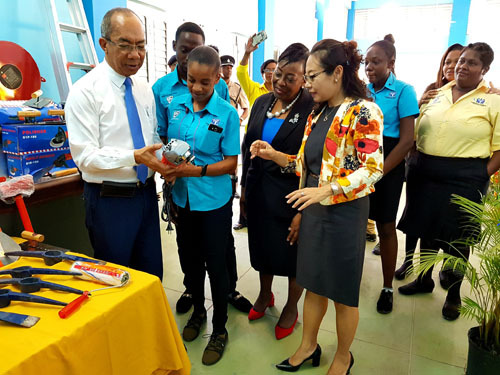 THIS IS HOW IT WORKS: Member of Parliament for North West St. James, Dr. Horace Chang assists student, Odeisha Martin, with an electric sander at Wednesday’s handing over ceremony of equipment by China Harbour to Flanker Skills Training Institute in St. James. Looking on are HEART Trust/NTA Acting Senior Director for Workforce Development and Employment Division, Elain Holloway and Deputy General Manager of CHEC, Dr Zhimin Hu. Approximately $4 million worth of construction equipment was on Tuesday handed over by China Harbour Engineering Company (CHEC) to the Flanker Skills Training Institute in St. James. The equipment consisted of 56 of 62 items requested of CHEC from a list provided by HEART/Trust NTA, through the Member of Parliament for North West, St James Dr. Horace Chang. They included sledgehammers, pickaxes, electric saws, electric sanders, spades, shovels, paint rollers, pipe wrenches, drills, screwdriver sets, a ladder and steel cutters. “Jamaica’s popular theme will become the new reality of a proud, progressive and prosperous country,” Dr Hu added. HEART Trust/NTA Acting Senior Director for Workforce Development and Employment Division, Elain Holloway thanked CHEC for their kind gesture. “I am sure that this investment will help to change the lives of many youth in Flankers and related communities,” stated Holloway, who also challenged the students to take the best care of the equipment and tools, as they could be used to become a passport for their future and their children’s future. Approximately five years ago, the training institute was constructed. However, after remaining closed for a number of years it was officially opened in May with its first set of students. MP Chang, who is also Minister of National Security, who lauded the community for protecting the centre, bemoaned the length of time it took for something to be done at the centre which cost the country almost $100 million for it to be constructed and equipped. He said the institution is seeking to ensure that the kind of activities that will attract a cross section of young people in the community and Montego Bay in general are implemented. Dr Chang pointed out that the presentation on Tuesday forms part of what is being done to ensure sustainability, and as such, the equipment will assist in starting a programme in property management (landscaping and maintenance). Dr Chang also noted that good things are happening within the community. He said by the end of the year, the Caribbean Maritime University (CMU) will take to the Western Region (Montego Bay) a simulator to train and certify operators of articulated vehicles. The implementation of a recording studio is also on the agenda for the MP for hopefully next year. And, the Jamaica Defence Force is currently looking at taking the Jamaica National Service Programme into Montego Bay. Dr Chang says he is hoping that the Flanker Centre will be used to facilitate such skill training from the JDF.